Have you checked out the Real Farmwives of America yet? 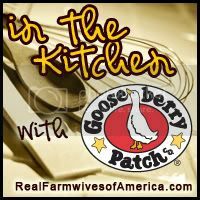 Heather over at 3 Kids and Lots of Pigs started the Real Farmwives and recently invited me and some other blogging gals to join her and the Gooseberry Patch In the Kitchen! Head over to Real Farmwives of America and vote for the cookbook you want ME to cook 10 recipes from and then give away to one lucky reader. There are a couple of very cool Christmas cookbooks and an interesting 101 Autumn Recipes choice...can't wait to find out which one I get to try out. I think I really need some new inspiration in the kitchen. I actually took photos of this last week and thought I should blog about it. with the quick and easy prep. Now, don't get me wrong, it was excellent but I think I can do better! So, head over to the Real Farmwives of America and vote today. lol! Looks good to me!! I voted!! That looks like dream food for my kids! Anything that is easy and healthy is good! It might not always be 4 star, but good is good! I voted. That looks simple and yummy. After cooking 5 days a week, by the weekend I am ready for something easy. I may have to try this!